Downtime occurs. It's an unfortunate fact of online life. 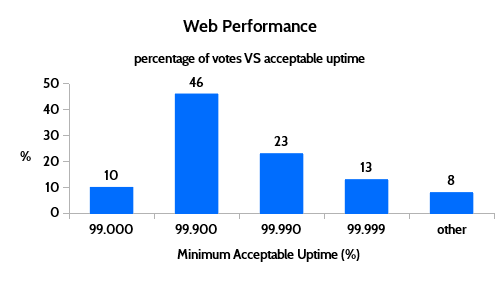 No website is able to provide 100% uptime - even tech giants like Google suffer downtime, albeit very occasionally. 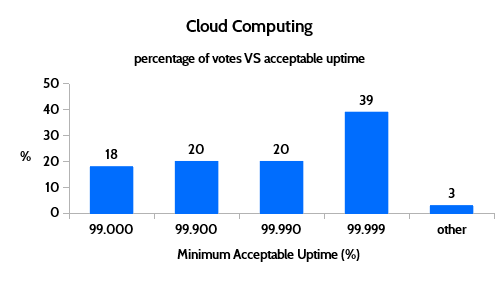 So, some amount of downtime is inevitable, but how much is acceptable? 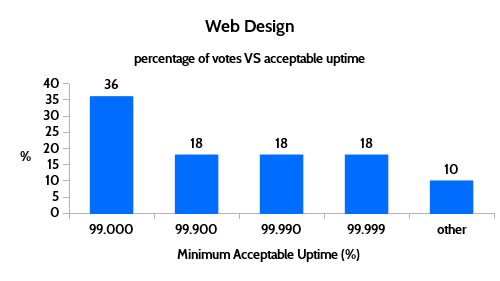 We ran polls across 14 different Google+ communities, asking the question "What's the minimum level of acceptable uptime for a website?" The options for answering were: 99%, 99.9%, 99.99%, 99.999% and 'other'. A big thanks to everyone who took the time to respond! 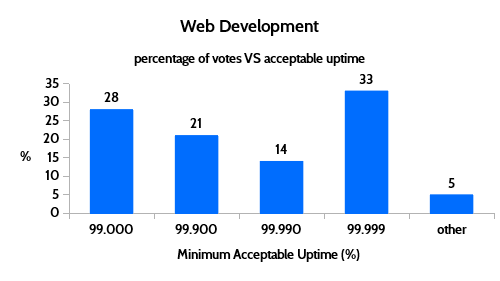 A community was selected for the poll if it was active, responsive, welcoming and if the topic of website uptime was considered relevant to the community. We can see that, although the most popular result was 99.999% there was no 'runaway winner'. 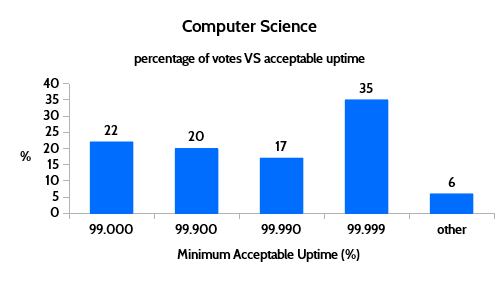 Therefore, we calculated an average result that would take all votes into consideration. Note that simply taking the mean of all the results would have led to an average that was skewed towards the lowest option of 99%. 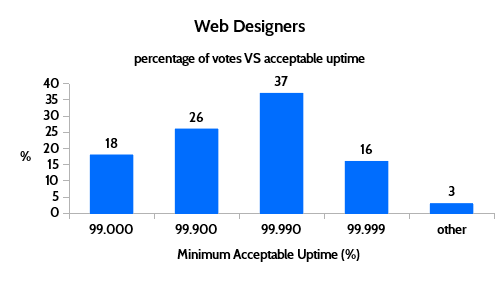 To avoid this we calculated a meaningful average that allocated all votes an equal weight - you can see the method used at the end of the article. 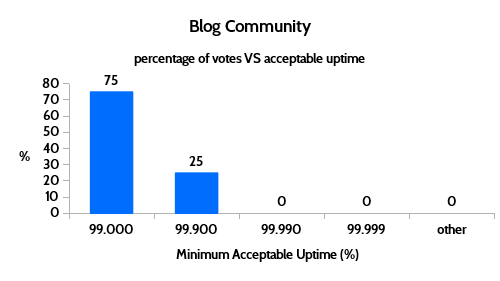 "For e-commerce 5 nines for sure, but for a personal blog 99% would be acceptable." "How many nines can you afford?" "How much does it cost if the site is down?" 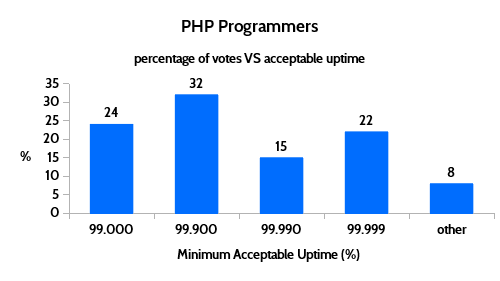 "99.999% (or even more) is pretty doable as long as you have the right architecture. I highly recommend reading the book 'Site Reliability Engineering: How Google Runs Production Systems'"
"Fun fact, the Apollo space program had 99.9% reliability as a goal while airlines today achieve 99.99999% reliability"
"It depends on when the downtime happens"
"It's not about what is acceptable, it's about 'what-it-is'"
"If a site goes offline on the web and no one is around to see it, does it make a 503?" 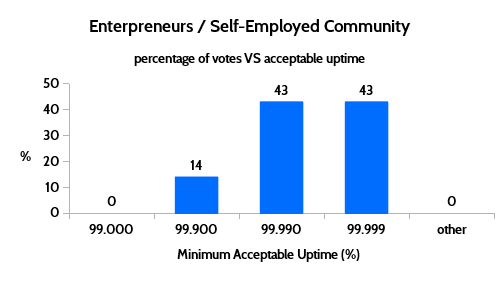 Here are the results broken down by community... or to go straight to the conclusions click here. 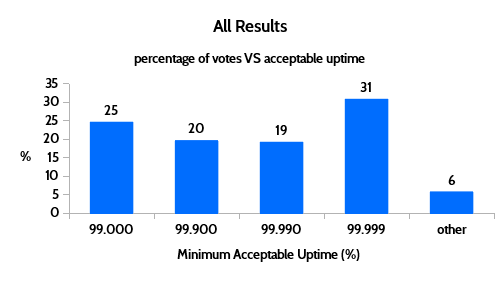 Uptime of 99.95% was the average result from the survey and this seems like a reasonable value, allowing just over 4 hours of downtime per year. However, not all websites are the same. 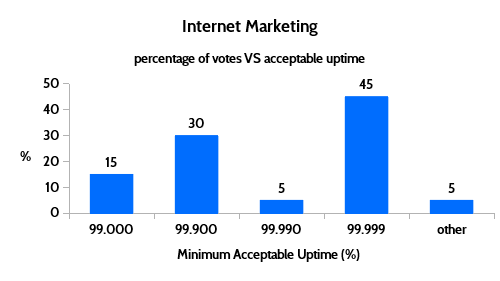 Busy sites for businesses will require higher availability while 99% uptime is acceptable for casual sites with few visitors. 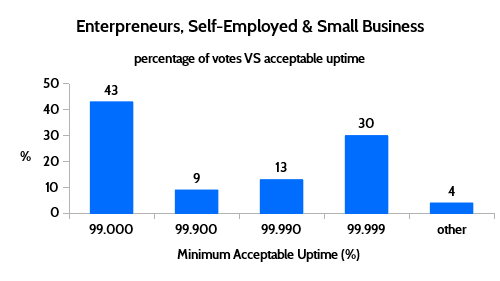 Two hours of downtime at 4am on a Sunday may affect fewer users than 5 minutes of downtime on a Tuesday afternoon. 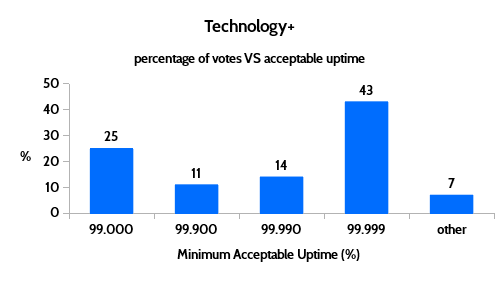 So, if downtime is inevitable, say for essential maintenance, it makes sense to schedule it during off-peak hours. Setting an uptime goal is one thing but making sure you achieve it is another. 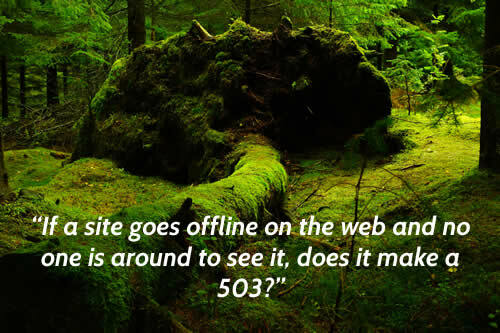 You should monitor your site and check the uptime stats regularly. Our free accounts have 3-minute checks and uptime stats to 1 decimal place and our pro accounts have checks every minute and uptime stats to 3 decimal places. Consider your acceptable uptime when setting custom alert times. 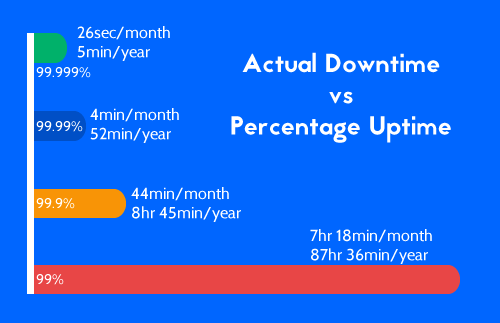 For a website that requires 99.99% uptime or more you will probably want to be alerted the instant the site goes down, but for a website that requires 99% uptime you could schedule alerts to be sent when the site has been down for 10 minutes. To avoid an average that was skewed towards the lowest option of 99% each option was allocated a weighted value on a linear scale. 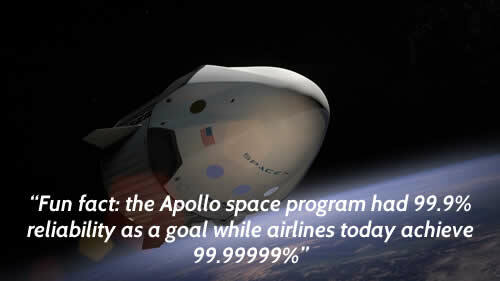 99% was given a value of x, 99.9% a value of 2x, 99.99% a value of 3x and 99.999% a value of 4x. A curve was then plotted of the weighted value against the percentage uptime. 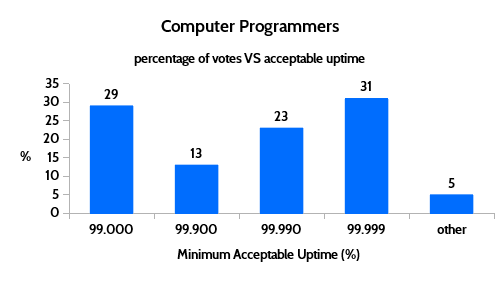 The mean weighted value was calculated by multiplying the number of votes for each option by their weighted value, adding the products together and dividing the total by the total number of votes. 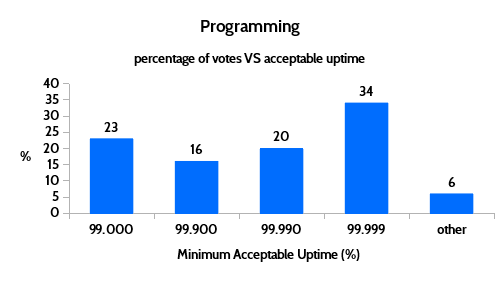 The mean weighted value was then applied to the curve and the corresponding percentage uptime was found.